A huge shout out to the Hatboro Horsham High School Key Club for hosting a holiday cupcake fundraiser for Simple Gifts Project! Thank you for your donations of coloring books and crayons too! Your support is a wonderful gift this holiday season! Thank you to the Central Bucks West Interact Club who raised enough money to fill 50 bags for Simple Gifts Project! Thank you so much for filling the bags and supporting us. You are a wonderful group of kids, and I look forward to working with you again in the future! Thank you to the William Tennent High School Key Club for helping to raise money for Simple Gifts Project. The group received a grant from the Centennial Education Foundation to buy the supplies needed to fill 20 Smile Bags! You were a great group of students and I thank you for filling all of those bags! I hope we can work together again next school year. Thank you to Chris, Sarah, and Sheila, from Hatboro-Horsham's Key Club, for coming with me to drop off 30 Smile Bags to Doylestown Hospital. We met with Garrett Owen, Director of Donor Relations, Pediatric Hospitalist, Dr. Komasz, Pediatric Outreach Coordinator, Ashley Heidler, and the head nurse for Pediatrics and Maternity during the visit. This picture was taken in front of the donor wall outside of the pediatric wing. Thank you to Doylestown Hospital for their continued support of Simple Gifts Project! Thank you to the Hatboro-Horsham Key Club for filling over 125 Smile Bags for pediatric patients at Doylestown Hospital and CHOP. What a wonderful and hard working group of students! I look forward to working with you again in the future. THANK YOU! Thank you to the Girl Scout Troop 814 for helping to make craft kits that will be given to children in local hospitals. This wonderful group of girls held a fundraiser in December, and were eager to help us out again. Thank you again...it was great working with you again! 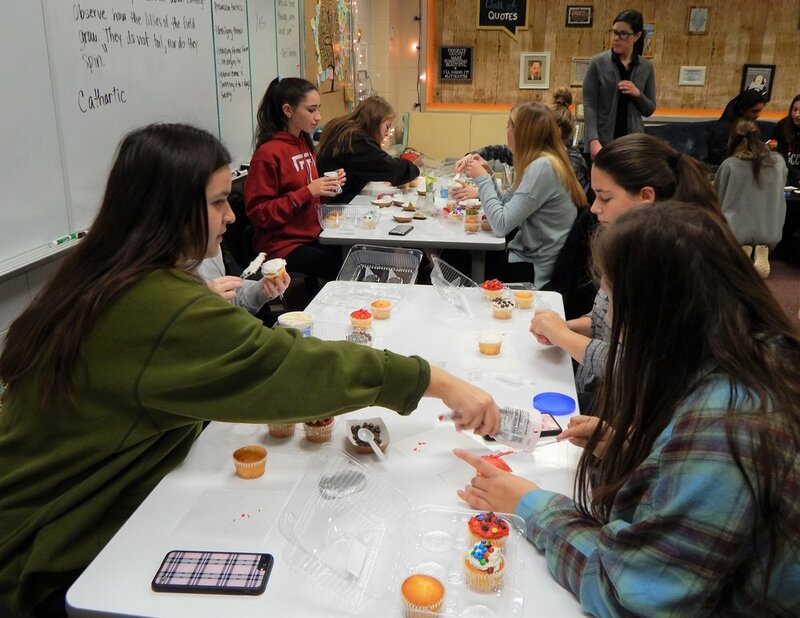 A BIG "thank you" to the Hatboro-Horsham High School Key Club for holding a holiday cupcake fundraiser! The money you raised will help to fill LOTS of Smile Bags! I look forward to working with you all again in the Spring! I had the pleasure to work with a great group of Junior/Senior Scouts from the Lehigh Valley Academy. They held a cupcake fundraiser and collected supplies for SMILE BAGS. I look forward to working with this group again in the Spring. Keep spreading smiles! Thank you to the Girl Scout Troop 8118 for holding a cupcake fundraiser. They collected LOTS of supplies for SMILE BAGS and had fun creating their cupcakes to help spread smiles! Thank you to Girl Scout Troop 63403 for decorating cupcakes and donating LOTS of supplies for Smile Bags! We could not do this without the support of troops like yours! Thank you to all the teachers and students at Aston, Pennell, and Coebourn Elementary Schools. Middle School students worked with their elementary school partners to fill bags and build smiles. We visited Girl Scout Troop 6810 and we had a great time decorating cupcakes and collecting supplies for Smile Bags. Thank you girls for helping our cause! I had a wonderful time with a great group of 7th graders from Northley Middle School last week. Thank you so much for your time, hard work, and creative ideas! Norhtley Middle School 7th graders work together...each with their own piece to the puzzle. Northley Middle School 7th graders making cards to put into the Smile Bags. Everyone taking part in working out a solution. Every student added a special piece to the puzzle. We could not do it without each person...giving their gifts to the project.